Prism believes there is clear correlation between the quality of information discovery and the team’s final strategic plan. Information discovery should include five-year trends and three-year forecasts on all critical performance indicators, a competitor analysis, and an analysis of all emerging legal, regulatory, legislative and technological issues that could impact the organization. Prism can also conduct assessments to understand customers’ current and emerging needs. Armed with this broad strategic knowledge, the planning team generates or validates a current mission, a vibrant vision of a preferred future, and a set of performance targets to measure progress toward the vision. 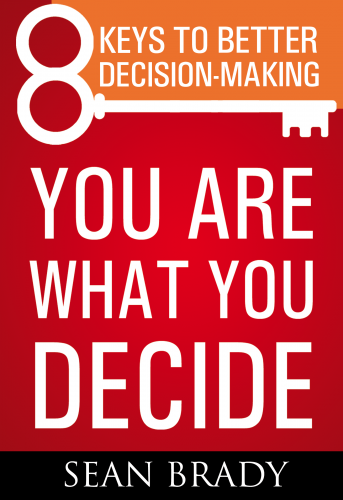 Decision-making occurs efficiently and painlessly as participants use Prism’s Group Decision Support System™ to assess each strategy in three “votes”. The first is a pair-wise comparison that allows participants to “look backwards from great success” and force rank the strategies in terms of their relative importance to achieving the vision. The second — a 1 to 9 vote — allows them to assess the organization’s current performance on each. The third allows participants to identify strategies as old or as new. Immediate Opportunities: Those very important strategies that are currently under performing are high-leverage, high pay-off opportunities that need immediate resources and implementation. 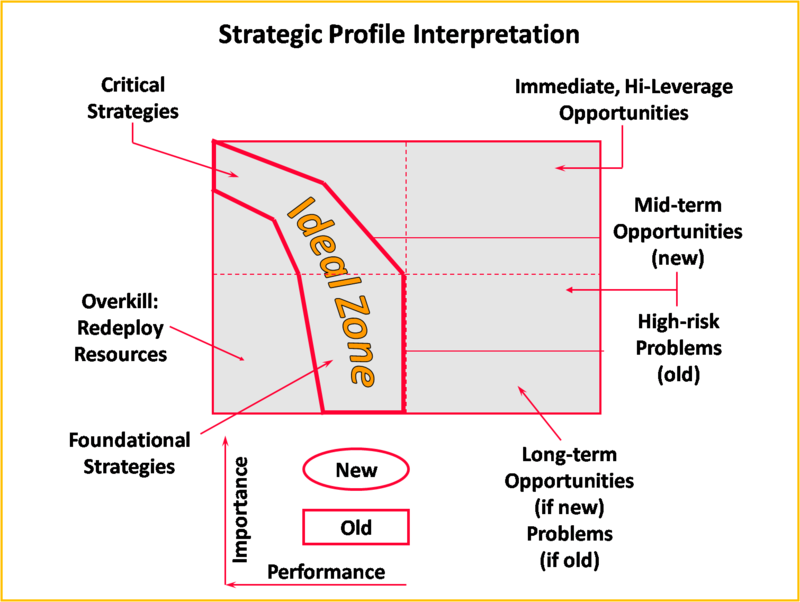 Critical and Foundational Strategies: Strategies whose performance matches their relative importance fall within the “ideal zone” and are necessary to success. They need constant attention but probably no significant new resources. High-risk Problems/Mid-term Opportunities: Under performing old strategies in the mid- to upper-range of relative importance are high-risk problems requiring immediate resources. New strategies falling in the mid-range of importance are key success factors in the emerging environment and should be pursued. 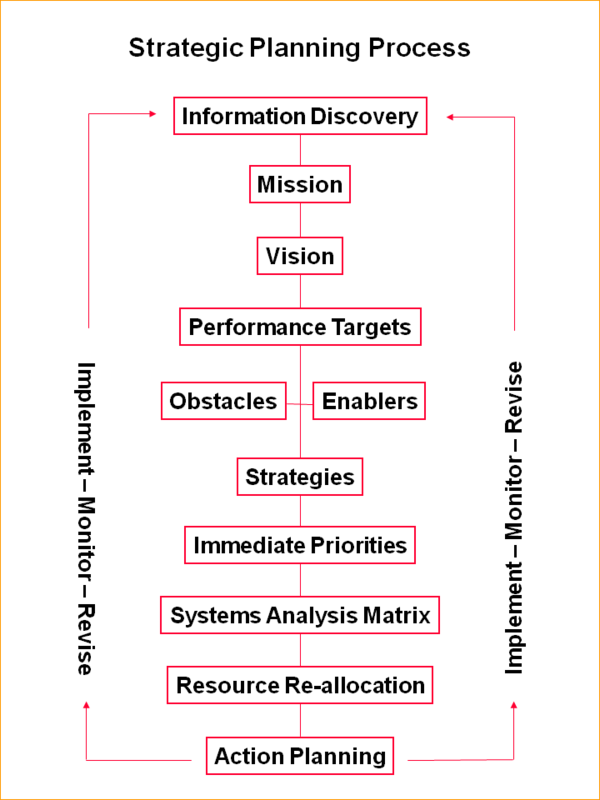 Uses our systems analysis matrix to complete a detailed assessment of current resource allocation against the newly prioritized strategies. Or immediately develops action plans for each priority strategy by identifying who will do what by when with what resources.